SAMPLE BOOK, From Avery Books. This is my first foray into Madeline’s hard copy books. On-line? All over it. Having my own copy hadn’t yet materialized. So, I can’t compare, but I can tell you what an amazing body of word is enclosed between these two covers now. Yup, I took it. Why not something more traditional? It’s NOT a traditional wine book photo, per se. 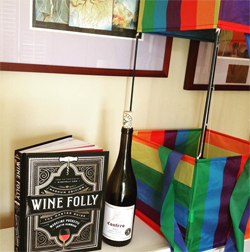 Because this photo is fun and nothing is more fun than kites, wine, and books. And who doesn’t want to go fly a kite, like right now, if that presented itself? The car engine is running as I write this, to go do just that, seriously. In 1971, I gave birth to my first child. I had already thrown out my TV years before. It was only producing junk, IMHO. But, when my daughter Katie Sunshine (yes, it was the times) became about two, I broke down and got another small box. The only channel Katie and I watched was PBS. And, the only programs we watched together were Sesame Street, Electric Company, and Mr. Rogers Neighborhood. By the time my daughter was four, she was reading proficiently, knew her numbers, and was writing love letters to me. We had a schedule for watching, so it was home schooling at two. She learned easily, because everything was in soundbites, graphs, charts, letters, numbers, songs, and a neighborhood of animation. We laughed and sang, counted and learned all about our happy neighbors. Numbers flashed, tiny snippets of stories were told, then back to repetition for the letter and number for that day. All three of my kids are still singing those songs. This was the method I used to teaching my pre-school scholars. 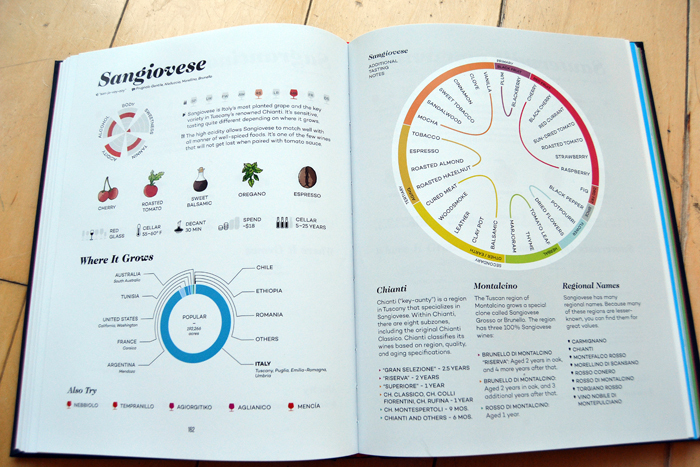 Because this body of work is a manifestation of how that generation of children now think… In soundbites graphs, charts, daring to try new things, not their parents’ wine enthusiasts, etc.. They’re on their own with wine, and this book speaks VOLUMES to them (as well as for me for references). It’s great for visual learners, too. Just an example, so you guys get on board with this one… so easy to read and enjoy. In teaching, a really great teacher reduces something very complex to its lowest common denominator and then builds on that strong skeleton… A chart does that by eliminating articles, verbs, pronouns, conjunctions, objects, etc. Is there any quicker way to learn? A graph also visually just takes numbers to a snippet hieroglyphic. Why did I use the Aberrant Confero bottle? This bottle of wine and wine book are both intended to do exactly that. Yeah, you’re going to really enjoy this book, wine book lovers, wine writers, teachers, librarians, sommeliers, novices, and pros… It a book of the times.